We have discussed about collapsible soil, loess in our previous many posts; here we will learn about collapsible soil other than loess. Sometimes poorly or loosely consolidated soil shows collapse potential. 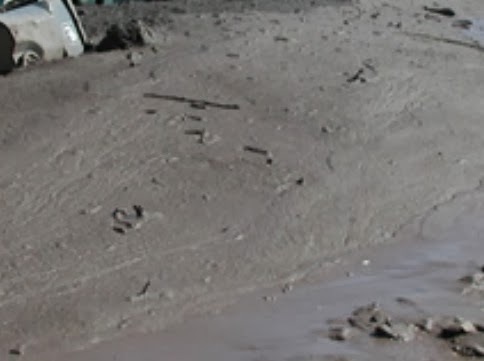 As an example we can include about deposits that are formed by mud flows and flash floods. These deposits after drying out looks stable soil; but collapse under change in load and moisture condition. Many residual soils also behave like collapsible soil. Residual soils are formed due to weathering of rock but remains in place of their origin. This phenomenon is occurred when weathering rate of rock is greater than transportation of weathered materials. In this regard wind, water and gravity contribute large share of residual soil to form, not transporting them. b. Climatic condition during formation of residual soil. As residual soils are involved in many engineering constructions, either as foundation support material or construction material, we have to predict their properties, including collapse potential, which is our concern in this post. The weathering action results soils having wide range of grain size distribution while formation of residual soil. Colloidal and soluble materials, by weathering action, leached out to produce large void ratio and render an unstable structure. Residual soils produced from parent granites, are found in large parts of Zimbabwe and South Africa.